The photograph “The Old Navy,” also known as “The Old Salts of the Square Rigger Navy,” taken on board the USS Mohican in 1888, is one of the most iconic images of America’s “Old Navy” and its enlisted men. Taken by Assistant Surgeon Hervey W. Whitaker, the picture features, from left to right, David Ireland, Gilbert H. Purdy, John T. Griffith, and John King. The careers of the four old salts in the photograph reveal certain noteworthy characteristics of the transition from the old to the new navy. David Ireland, age 55, enlisted in 1850 and was in his 38th year of service when the picture was taken. As a member of the Mohican’s crew from May 25, 1885, to November 20, 1890, Ireland served as captain of the forecastle, captain of the hold, seaman, and quartermaster. In correspondence with Captains John R. Y. Blakely and Joseph K. Taussig, who attempted in 1913 to identify the men pictured, Ireland’s commanding officers, Rear Admirals Reginald F. Nicholson and Edward W. Eberle, and Captain Robert L. Russell describe “Old Ireland” as a thrifty teetotaler, possessing two qualities rather uncommon for enlisted sailors of that era. Lieu Tisdale, a later shipmate of Purdy’s in USS Olympia, also reports that Purdy served with the USS Kearsarge during its triumph over the CSS Alabama, one of the Confederate Navy’s most successful commerce raiding ships, at the Battle of Cherbourg, which occurred on 19 June 1864. In his account, Tisdale reports that Purdy was a member of the “star gang”, twenty men from the Kearsarge who commemorated the victory and made an oath of fidelity to the Navy by tattooing blue stars on their foreheads, making them unfit for any other profession. 4 Purdy, however, does not appear on the roster of enlisted men for the Kearsarge when the battle took place 5 and it is possible that Purdy, a noted yarn-spinner, was simply trying to put one over on Tisdale. As for the tattoo itself, he describes it as “startling…in the middle of a high forehead, [a] visible and outward sign of the star gang,” 6 but it is not visible in the “Old Navy” photograph. Tisdale does not indicate when the men of the Kearsarge crew first received their tattoos, so it is possible that Purdy got his blue star after the 1888 photograph. John Griffith, the senior member of the group at 62 years old, served as carpenter’s mate aboard the Mohican. He was born in Albany, New York, on 25 December 1826, but the date of his first enlistment remains unknown. Before joining the Mohican on 3 June 1888, Griffith served with the wooden screw gunboat USS Adams, an Adams class gunboat that displaced 1400 tons and had a sailing speed of 9.8 knots. 9 Nicholson reports that Griffith, or “Griffin” as he incorrectly remembers him, was a quiet sailor. John King, age 54 and seated with a pipe in his mouth in the photograph, was born in England in 1834 and served as chief gunner’s mate with the Mohican from May 1885 to January 1889. Before enlisting in the navy in 1872, King gained experience in sailing and seamanship through his service aboard merchant marine vessels. King was the antithesis to the thrifty and alcohol-abstaining Ireland and his behavior was more in line with the stereotypes of the Old Navy’s sailors. As his officers remember, every time King had liberty, he would squander his monthly pay on rum and run off only to be dragged back each time by the master-at-arms. In his correspondence, Eberle recounts two of King’s adventures ashore that demonstrate his free-spirited attitude toward liberty. In the first incident, King broke liberty in Nicaragua and a bounty was placed for his return. During the subsequent police chase, King ran to the beach and swam to the gangway of the Mohican, eluding capture from a nearby patrol boat. In the second adventure, King went ashore in Peru with his shipmates’ money to buy stores for his mess, having been elected its caterer. After purchasing and sending back a bag of salt and some cheese, King stayed ashore for ten days until police returned him to the ship. Despite these escapades and others, Eberle concludes, “[King] was a good and faithful old soul, and was busy from reveille to taps,” 10 and that he and his shipmates, King, Ireland, and Purdy, were the most able and reliable seamen with any ship in the U.S. Navy. Had he known Griffith—he left the Mohican before Griffith came aboard—he would have likely concluded the same about his abilities and work ethic. The photograph in question is interesting because it captures four distinct personalities of the Old Navy in a candid moment: Ireland, the thrifty teetotaler; Purdy, the outgoing yarn-spinner; Griffith, the quiet veteran on his way home from the service; and King, the boisterous, free-spending rogue. More interesting, however, is the juxtaposition of these men, “grizzled old salts” in navy vernacular, with America’s newly evolving steel navy. While not quite “living relics,” men like these four “sea dogs,” sailors who gained their skills in wooden ships during the Age of Sail, seemed increasingly out of place and even anachronistic in their presence as the use of sail power decreased in the United States Navy. America’s transition to a modern steel navy required sailors to possess a new and different type of knowledge and expertise from what they had in the past. As reliance on sail power decreased, the navy relied less on seamanship and the petty officers that had acquired such skills in the era of wooden ships. How did the Old Salts fare as a new age, one with new technology and the associated challenges, decreased their role in America’s evolving navy? It is difficult to answer categorically, but first-hand accounts, observations, and even yarns seem to indicate that these petty officers were still a welcome and reliable presence aboard because of their experience and contributions to the morale of these ships. The transition to the new steel navy had a dramatic impact on the demographics and character of its enlisted men as recruiting became increasingly focused on the creation of an “All-American” navy. As ships became increasingly reliant on new technology, one that gave precedence to steam over sail, the navy expected its bluejackets to be skilled mechanics as well as sailors. The extensive change and disestablishments of various ratings for petty officers during this transitional period demonstrate the shift in emphasis. Changing technology onboard ships necessitated a change in the ratings system for enlisted men in the navy to reflect the new duties sailors performed. Although the navy had established steam-related ratings, such as coal heaver (1842), fireman, machinist (1866), and blacksmith (1879), to name a few, it was slow to create these ratings because of its overall resistance to embrace such technology. In 1885, the navy legitimized these ratings by developing a formal classification system, one that included seaman, special, and artificer branches, all divided into six tiers, from seaman, third class, to petty officer, first class. 14 By this time, petty officers in the artificer’s branch earned more than their counterparts in the other two branches. At the same time this reorganization was occurring, the navy was also disestablishing pay ratings to reflect the change in its personnel; between 1883 and 1893, more than 30 ratings were disestablished. In 1893 alone, the navy got rid of the ratings captain of the forecastle, captain of the hold, captain of the maintop, captain of the mizzentop, and carpenter in recognition that the skills associated with these professions were increasingly obsolete in the New Steel Navy. As Frederick Harrod writes in Manning the New Navy, “Although some ships still carried canvas, sails were no longer important to the navy; thus it was no longer necessary to give special recognition to the men skilled in handling them.” 15 After 1893, old salts like David Ireland, who had served as captain of the forecastle aboard the Mohican, and captain of the hold Gilbert Purdy, had fewer opportunities to remain petty officers and earn the associated pay. In Smith’s opinion, the seamanship skills of the Old Navy were not sufficient to handle this new technology and the navy required a new breed of enlisted man, one who was as modern as the weapons and machinery he was handling. Frederick Wilson, a water-tender who served with the New Orleans during the turn of the century, put it more bluntly in his personal log, writing, “there is required to man these steel walls 99% more brain than the old wooden ships required.” 17 Of course, Wilson is subject to bias due to his position as an engine room water-tender in the artificer’s branch, but his point remains that the ships of the new steel navy, which were becoming less and less reliant on sail-power toward the dawn of the twentieth century, required a different sort of intelligence from its enlisted men. In some ways, the career paths of the sailors pictured in the “Old Salts” photograph reflect continuity rather than the changes in the navy at the end of the nineteenth century. With the exception of Gilbert Purdy, who served with the USS Olympia under the command of Admiral Dewey during the Battle of Manila, none of the men served with a ship that had been laid down after 1883, the beginning of the steel navy. The incorporation of steam-powered steel ships into the active fleet and the retirement of warships vessels propelled by a combination of sail and steam was a matter of time, meaning that the usefulness of men skilled in the handling of square-rigged ships only gradually disappeared. After his service with the Mohican, Griffith joined the crew of the Vermont, a 74-gun warship that was laid down in 1818 and finished in 1825, but remained uncommissioned until 1862. Owing to severe damage to its hull caused by a storm in 1862, it returned to New York City in 1864 and served as a receiving ship for 37 years. 18 Griffith served with the Vermont until his discharge on 10 December, 1889, and his shipmate John King also served with it until he was discharged on 2 April 1896. It is unknown whether David Ireland served with another ship after leaving the Mohican in November 1890 during his fortieth year of service. Because these three sailors did not serve with truly modern ships, their experiences do not mirror those of enlisted men like Frederick T. Wilson; their duties did not demand them to be familiar with the most up-to-date technology. By the time Griffith and King were with the Vermont, it was already around seventy years old and a living reminder of the bygone Age of Sail. The fact that these three men did not serve with modern steel ships, however, can also be interpreted as representative of the changes of this period. The navy did not expect these old salts to be able to properly handle new technologies and preferred to man newer ships with younger, perhaps American, enlisted men who had received specialized training rather than to teach old dogs new tricks. Old salts did not, however, disappear completely from the ships of the new navy, a fact that the career of Gilbert Purdy illustrates. Gilbert Purdy, who was 72 years old when he was discharged in 1900, had fought in both the Civil War and Spanish-American War, and was the oldest man on the navy register when he died in 1912, is an exceptional example of how petty officers who had gained their skills during the Age of Sail remained a visible part of the navy as it transitioned to steel ships which demanded a different sort of technical knowledge. First-hand accounts, observations, and even yarns indicate that these petty officers were still a welcome and reliable presence aboard owing to their experience and contributions to the morale of these ships. In his opinion, the new navy, with its advanced machinery, lessened the need for the “human element” and “personal touch” of the old salts and their seamanship. Goodrich also held a romantic view of these career sailors and the ships with which they served. On a cruise to the Caribbean in 1892, he writes “It should be said that no better school in human nature has ever been known than the old time sailing vessel, so intimate was the contact of every officer with every man.” 26 The implication here is that the organization of the new steel ships did not promote the same camaraderie between officers and enlisted men, the sense of unity that made service in the Old Navy so personal. The collection Yarnlets: The Human Side of the Navy by Rear Admiral Edward Simpson also provides accounts, likely fictional, of the ways in which the old salts of the navy affected morale afloat. The story “Sponge Cake” concerns an old quartermaster, “a crotchety sailor of the old school” who had served during the time of the Old Navy. This old salt had much disdain for the new navy with its “electrical gadgets and gewgaws that he couldn’t understand, and that were only fit for the youngsters to handle” and would spend his time pacing and growling about the way things used to be. One day, the officer of the deck ordered the quartermaster to look after ship’s goat, Bill, who was eating a pan of slush, which was salt pork grease used to break down hardtack and make “duff,” a type of raisin cake popular with the men. The quartermaster decided to have his fun at the expense of the newer sailors by calling the slush “rice pudden” and railing “we don’t have ‘duff’ any more…Now they puts milk in it, and sugar in it, and eggs in it–regular Sponge Cake!” 27 The yarn suggests that such old salts were often objects of amusement rather than scorn or derision, somewhat comical reminders of the past. Modern ships’ crews also valued these older sailors because of the knowledge and pearls of wisdom they offered. One collection, entitled “An Old Salt’s Salty Saltings,” provides such advice as “Don’t tell ther fellers how yer did it; let others do it fer yer”; “If yer have dirty clothes, wash ‘em ter-day; ter-morrow may be cloudy”; and “Never think ther ship can’t get along widout yer. If yer does, don’t think loud.” 28 The compilation indicates that sailors thought highly enough of the old salts and their experience-based wisdom to collect their advice and if they did not find the offerings particularly useful, they were at least amusing enough to retell to others. 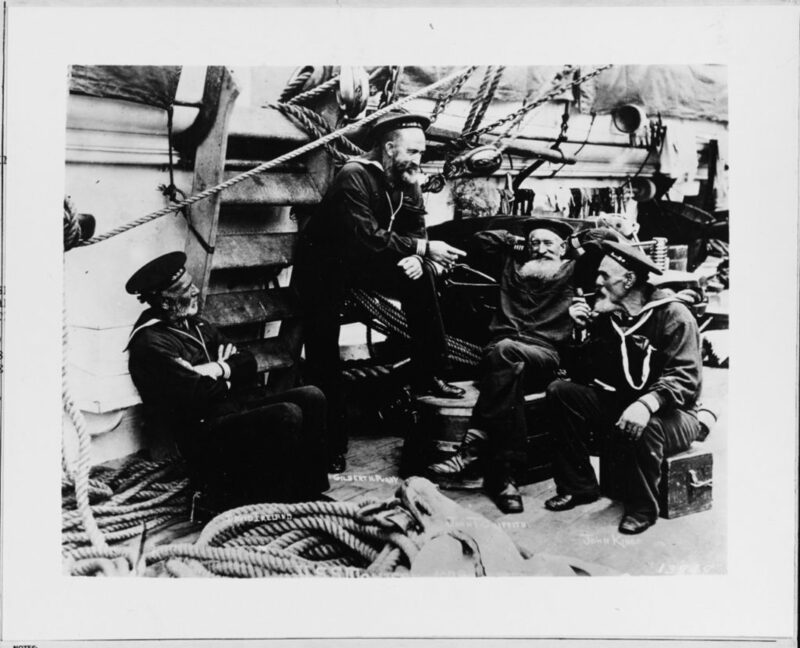 The “Old Salts” photograph has endured because it captures four career sailors in a moment of relaxation. The historical context of the photo, which was taken in 1888, makes the photo even more poignant because it depicts a class of enlisted men that was slowly but surely on its way out of the navy as new technology required a different breed of sailor, one whom the navy expected to be skilled in engineering as well as seamanship. Many of these old salts, including three in the photograph, never even served with truly modern vessels and those that did likely had light duties and were “quietly filling the niches that Time has carved for them.” 29 These men, however, did not disappear without leaving an impact; members of the crew admired them and saw such old salts as a reliable source of yarns, wisdom, and morale. This entry was posted in Article and tagged roy greim, Steel Navy. Bookmark the permalink.